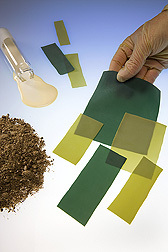 Clockwise from bottom left: bagasse, liquid latex, colored latex samples, and a glove, all products from the guayule plant. Perhaps the single most valuable gift the desert-dwelling guayule plant offers us is its superb natural latex. The white, rubber-rich substance, extracted and purified from this southwestern U.S. native shrub (Parthenium argentatum), is ideal for making high-quality gloves, medical devices, and other in-demand natural rubber products. Importantly, latex from guayule (pronounced why-YOU-lee) is free of the proteins responsible for the sometimes-deadly latex allergies caused by the most widely used natural-rubber source, the rubber tree, Hevea brasiliensis. But guayule may also prove to be an economical, environmentally friendly source of yet another prized commodity: energy. That energy can be made from the ground-up stems and branches, called “bagasse,” that are left after their latex has been removed. “Bagasse is a soft, light-brown, sawdust-like material,” says ARS chemist Colleen M. McMahan. “Guayule bagasse would provide 8,000 to 9,000 Btu per pound—about the same as charcoal.” She’s with the Crop Improvement and Utilization Research Unit, part of the Western Regional Research Center in Albany, California. Now, along with ARS colleagues there and in Arizona and Pennsylvania—and industry and university coinvestigators—McMahan is probing guayule’s potential as a fuel of the future. Guayule offers other biofuel benefits. For example, it isn’t a food or feed crop, so it won’t compete with those uses. And the latex-extraction process is clean, green technology because it uses water—not harsh solvents. Developed and patented by former ARS plant physiologist Katrina Cornish, the process is licensed to industry partner Yulex Corporation of Maricopa, Arizona, where Cornish now works. Guayule shrubs can first be harvested as early as 2 years after planting. By then, they’re typically at least 3 feet high and several feet across. Sliced just above the ground, they regrow vigorously and are ready to harvest again in another year and a half or so. 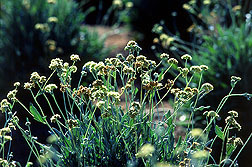 Guayule is under development as a domestic source of natural rubber and bioenergy. 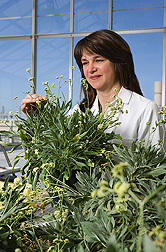 Chemist Colleen McMahan inspects 1-year-old greenhouse-grown guayule plants at ARS’s Western Regional Research Center, Albany, California. In addition, guayule “thrives in an ecosystem where many other biofuel crops couldn’t,” says McMahan. The hardy shrub requires less fertilizer than other crops currently produced in the desert Southwest. Even though a few herbicides are needed while the plants are getting established, once that happens, there’s no need for more, or for any fungicides, insecticides, or nematicides. McMahan (ARS), Yulex, and Mendel Biotechnology, Inc., of Hayward, California, are collaborating in work to determine how transferring new genes into guayule shrubs might yield more latex. Plant molecular biologist and unit research leader Maureen C. Whalen is directing this biotech venture; geneticist Terry A. Coffelt and plant physiologist and research leader Michael E. Salvucci at ARS’s Arid-Land Agricultural Research Center in Maricopa, Arizona, are collaborators. At Albany, chemist Kevin M. Holtman has already made ethanol from guayule after pretreating it with a process—invented elsewhere—known as “organosolv.” This pretreatment makes guayule bagasse “quite amenable to being fermented into ethanol,” he says. Guayule may be one of the newer additions to the long list of hardwoods suitable for organosolv pretreatment. As with all hardwoods and other green plants, guayule cell walls are made up of cellulose, hemicellulose, and lignin. “The value of using the organosolv process,” says Holtman, “is that you get not only cellulose that’s readily fermented into ethanol, but you also can recover the hemicellulose and the lignin. In other work, Akwasi Boateng, a chemical engineer at ARS’s Eastern Regional Research Center in Wyndmoor, Pennsylvania, is looking into converting guayule bagasse into bio-oil using pyrolysis—heating the bagasse in the absence of air. “The energy content of the guayule bio-oil we tested here at Wyndmoor is more than 13,000 Btu per pound,” says Boateng. That’s about 70 percent of the Btu in No. 6 diesel oil, the kind used primarily to heat boilers, he says. “We’re also testing gasification, which is combustion under ‘starved oxygen,’ to make syngas,” Boateng adds. Syngas can either be burned in a turbine to generate electricity or converted into diesel fuel. As the research continues to heat up, perhaps guayule will become tomorrow’s biofuel “queen of the desert.”—By Marcia Wood, Agricultural Research Service Information Staff. Colleen M. McMahan, Maureen C. Whalen, and Kevin M. Holtman are with the USDA-ARS Western Regional Research Center, 800 Buchanan St., Albany, CA 94710; phone (510) 559-5600, fax (510) 559-5777. Terry A. Coffelt and Michael E. Salvucci are with the USDA-ARS Arid-Land Agricultural Research Center, 21881 N. Cardon Lane, Maricopa, AZ 85239; phone (520) 316-6359 [Coffelt], (520) 316-6355 [Salvucci], fax (520) 316-6330. Akwasi A. Boateng is with the USDA-ARS Eastern Regional Research Center, 600 E. Mermaid Lane, Wyndmoor, PA 19038; phone (215) 233-6493, fax (215) 233-6406. "Guayule: Go Native With This Promising Biofuel—and Biomedical—Crop" was published in the February 2009 issue of Agricultural Research magazine.